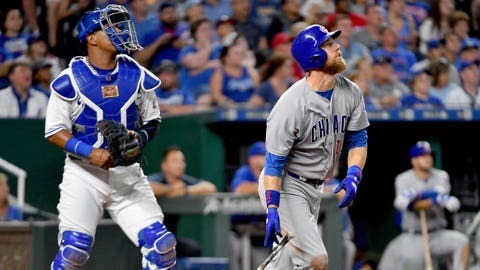 Former Royal Ben Zobrist hits a sacrifice fly in the fifth inning. KANSAS CITY, Mo. — Mike Montgomery continues to dominate the club that drafted him out of high school. The Cubs upped their NL Central lead to two games over second-place Milwaukee, which lost in San Diego. Montgomery (4-4), whom the Royals drafted in the first round in 2008, picked up his first win since June 29. Montgomery is 3-0 with a 0.40 ERA in four appearances against the Royals. Bote’s first career triple with two out in the first scored Ben Zobrist and Jason Heyward. His fifth-inning single scored Javier Baez. Victor Caratini, who led off the inning with a single, scored on Zobrist’s sacrifice fly. Zobrist left in the bottom of the inning with left hip tightness but will likely play Wednesday. “That fifth inning just kind of snowballed on me,” losing pitcher Brad Keller said. Ian Happ‘s sacrifice fly in the eighth scored Bote with the final run. The Royals have lost six straight and are 14-43 since May 30. They are tied with Baltimore for the worst record (34-79) in the majors. Cubs 3B Kris Bryant took grounders and played catch but has not picked up a bat since going on the disabled list July 24 for the second time with left shoulder inflammation. “I’m really bored, not fun at all,” Bryant said. “But you gotta do what you gotta do to get healthy and, hopefully, it never happens again. It’s frustrating. It’s not fun to go in the trainer’s room every day. I feel like I’m normal, but it’s only when I’m swinging the bat.” No timetable has been set on when the 2016 NL MVP will return. “I’m not going to get ahead of myself,” he said. Royals: RHP Heath Fillmyer is looking for his first big-league victory.